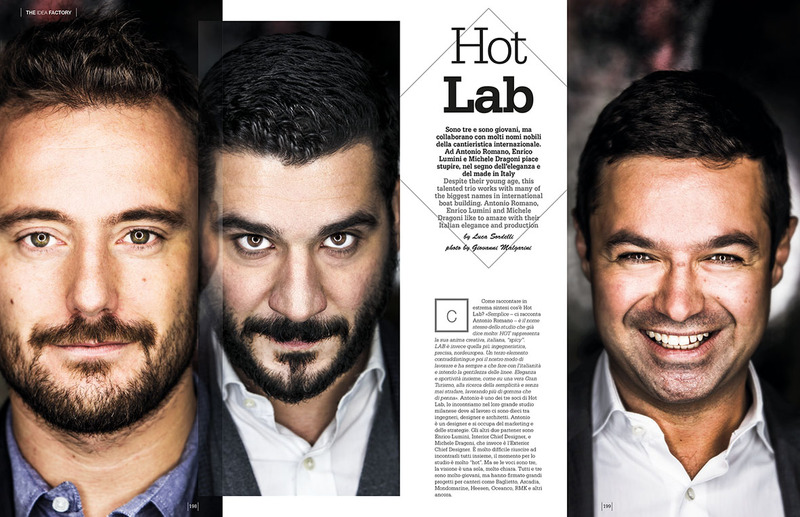 Can you sum up Hot Lab in just a few words? “That’s easy,” says Antonio Romano. «Our studio’s name says it all. HOT represents its heart, which is “spicy”, Italian and creative. LAB represents the engineering side of it, which adopts northern-European-style, precise approach. Meanwhile, a third element characterises our way of working, which has always been all about ‘Italianness’, that is to say designs with great finesse. They’re both elegant and sporty at the same time, like a real Gran Turismo, seeking out simplicity and never overdoing things». 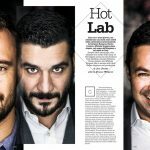 Antonio is one of the three partners at Hot Lab. We meet him in their spacious office in Milan, where ten people – engineers, designers and architects – are at work. Antonio is a designer and he deals with marketing and strategies. 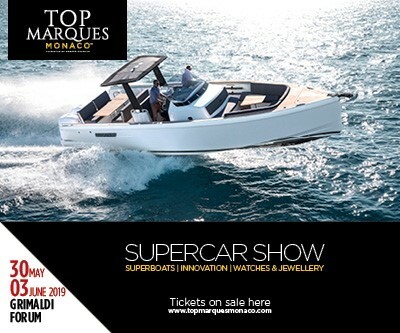 The other two partners are Enrico Lumini, Interior Chief Designer, and Michele Dragoni, Exterior Chief Designer. It’s very difficult to meet them all at the same time, as this is a very “hot” time for the studio. However, while there are three separate people involved, they have a very clear single vision. All three of them are very young, but they’ve already put their names to major projects for yards such as Baglietto, Arcadia, Mondomarine, Heesen, Oceanco, RMK and many others. They made a very interesting debut in the world of boating. «We met when we all worked for the same pure product design studio. We all had a personal history tied in some way to the world of boats and the sea, but we’d never worked in this field. In 2003 we decided to visit the Salone di Genova. These were still the golden years and our aim was to visit the accessories pavilion and put ourselves forward to design a bitt, a winch… but things didn’t go to plan». No results? Sent packing?«Yes, that’s what happened in the accessories pavilion, but then we decided to take a look at the boats too, the ones in the water. We also visited Raffaelli and hopped on board a boat, boasting about our extensive connections in the world of boating and our grandparents at Riva in order to be picked from among all the onlookers on the pier. It was there that something unexpected happened. Raffaelli commissioned us to design their 66’ flagship. With the first – very little – money we made, we bought a laptop and a fax machine and got to work». This is something of a fairy-tale start. How did it go after that? «We were very young, just 24/25 years old. It’s difficult to be accepted into this world. We started off by dealing with small boats and small partnerships, with Blu Yachting and Salpa for example». However, now you specialise in superyachts. That’s a considerable step up.«We’ve always worked calmly and with great professionalism. We like to be precise and this has always been much appreciated. We’ve also taken great care never to take too big a step forward and we’ve focused on our communications. And this has produced results». What was the first really big boat you dealt with? «The refit of a 1979 Akhir together with the architect Radovic, in Greece. We also started learning about how to proceed, the ‘mysterious’ role played by brokers, how to make the most of trade fairs, how to deal with the press».In other words, you grew up and, if I’m not mistaken, you’ve done so by maintaining direct contact with boat owners, rather than tying yourselves to individual yards. «Absolutely. This second phase has only taken place over the last three years. 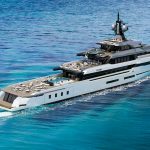 The first private owner had a 37-metre Noor from Bilgin Yachts. Then other important boats came along, such as the Filippetti Yachts Biscuit 95and, above all, the Keyla 45, rebuilt out of a Trinity». Why was the Keyla 45project so important for you? «It was for Turkey’s most important family in industrial terms. From then on, thanks to word of mouth, we have become a reference point in that country and we currently have four boats under construction there measuring 68, 60, 43 and 41 metres. Two of them will be launched in 2019 and 2020». And what about Italy? 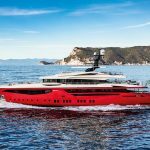 «Our most important projects have been the Eleonora III andDivine, two boats built by Columbus, with exteriors by Sergio Cutolo. We also obtained these two commissions thanks to direct contacts with boat owners. And both of them have won awards, another constant feature in our history that has helped us to grow». 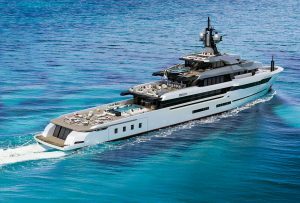 This direct relationship with superyacht owners has definitely made it possible to understand what they want, how they think. What are they looking for? What do they perceive as luxury? «They want to amaze their guests, but not with gold taps, designer sofas or snakeskin walls. They want to impress them with innovations, technology and construction quality, which make it possible to travel in total silence, for example, with no vibrations. 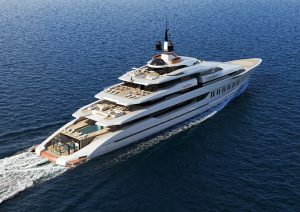 And it also means having all the water toys possible on board, as well as a wine cellar. Luxury is the result of real on-board comfort». 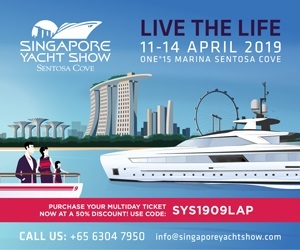 We’re joined by Enrico Lumini, on his way back from a conference where Hot Lab had been invited to talk about how the way of life on large yachts is changing. 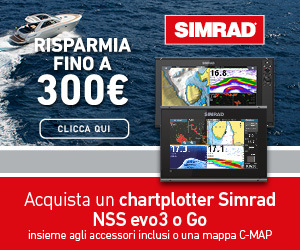 He’s therefore very well-prepared when it comes to this subject: «Since 2007 we’ve observed a change of attitude in the requests we receive, an ongoing development that has happened at almost the same time among the majority of boat owners. They all ask for the same things». That’s very interesting. And what do they want? «Space, either real or perceived. This is the case wherever they come from. 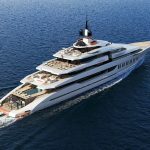 If they complain about anything it’s that there’s not enough height – we worked on a 66-metre boat where the owner wanted the lounge to be 2.7 metres high – or width». And has design supported this desire for space? «Absolutely. Just think of the Explorers and how they spread so rapidly across the market. This happened because they’re the best fit for this requirement. The mere length of the boat is no longer important. There has to be a strong architectural connection with the exteriors. The perception of the internal volume absolutely has to be amplified. This explains the appearance of endless glass walls. When it comes to interiors, the practical requirements haven’t been revolutionised, but the relationship with the exterior has been». All this makes us understand that while owners once wanted to amaze people first and foremost with what was outside the boat, from the exterior inwards, now the opposite is the case. They want designers to produce something that will surprise everyone who enters in the way that they perceive their surroundings, without too many separations between inside and out. And perhaps it’s no coincidence that Navettes and Explorers travel slowly, decidedly more slowly than the large yachts of a few years ago. And that speed is no longer such an important value. «Exactly. They’re the ideal shape for what the owners want».Let’s go back to talking about your projects. While the direct relationship with owners has always been very important, you have also built up solid relationships with boat yards over the years. 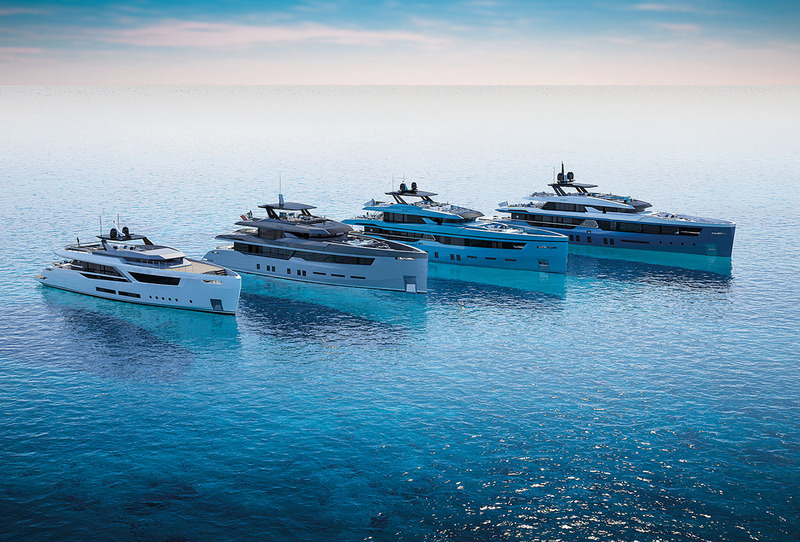 «Yes, the first was Mondomarine»,says Antonio Romano. 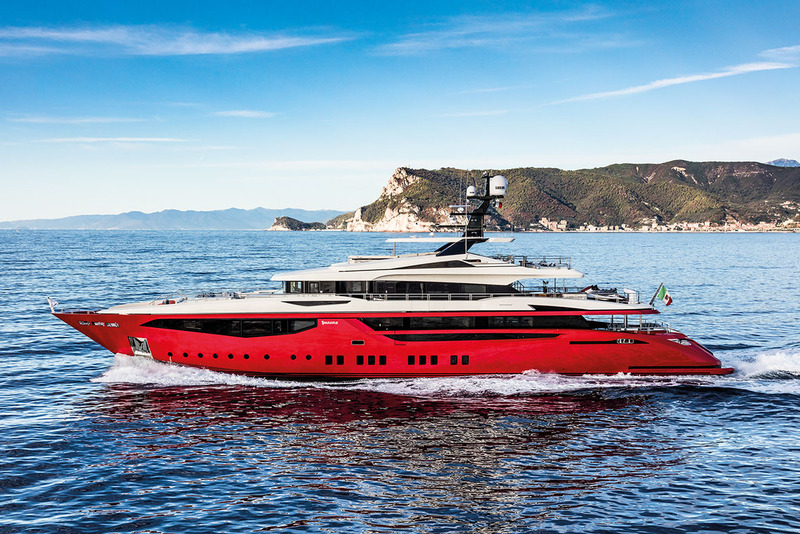 «When Marco Stroppiana was there they commissioned us to design a real range, with a 43, a 60 and a 50-metre boat. The latter became Ipanema. Its extreme but elegant lines make it look like it was designed with a single, unbroken pencil stroke, perfectly representing Hot Lab’s way of thinking». 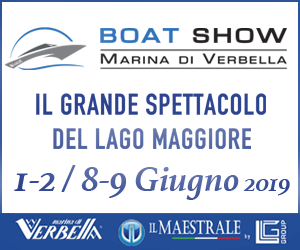 Then there’s Baglietto, a legendary and noble name in international boat building. «We have a very intense relationship with them. We’ve been contributing to the development of the V line for two years.Now we have a 54-meter long pleasure ship under construction and something even more interesting will be coming out with them next year, but I can’t say any more at the moment». Hot Lab has a very strong relationship with Arcadia, who represent the desire for revolution. 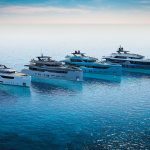 «We have been working on the interiors and exteriors of all their boats since January 2017. It’s a very strong brand. You either love or hate their boats. 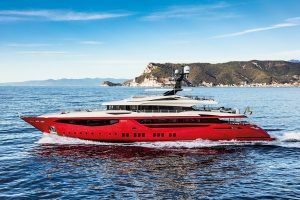 However, what is certain is that it’s one of the most important reference points in the world of contemporary yacht design. 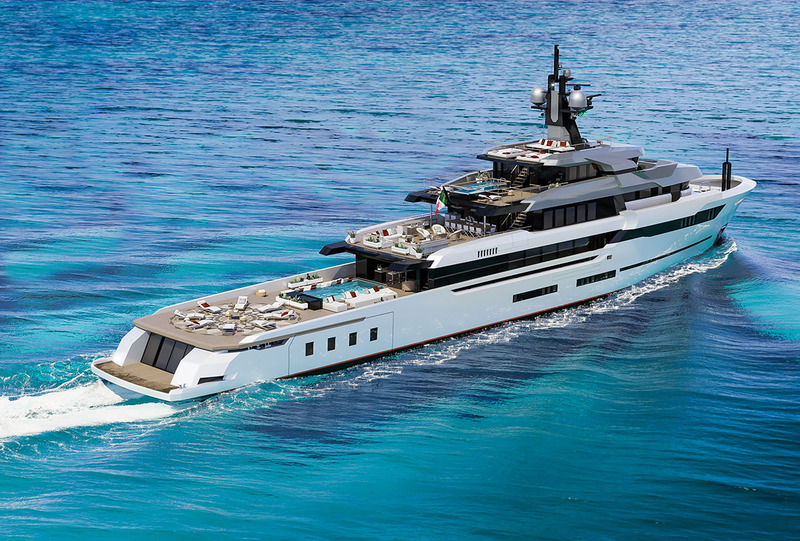 Two A105yachts, featuring our interiors, have already been sold and we recently presented the new Sherpa XL, which will make its debut at Cannes».So, the situation is always very “Hot”, for a laboratory of ideas that never tires of inventing.